Continuing the story of how form at the boundary of the Mandelbrot Set traces out the evolution of our universe, we now come to the current cosmological era. In the age before decoupling, atomic matter was not possible, because the universe was far too hot for atoms to be stable. The coupled state of matter and energy was like a pressure cooker for the constituents of matter that prevented the phase change which would allow atoms to congeal out of the matter/energy soup. Instead; atomic nuclei were being formed, and there were plenty of free electrons, but there was no real opportunity for them to combine into atoms. That possibility did come after matter and energy decoupled, but it was a while before the universe took on the appearance it has now. The universe had to cool and expand still further, in order for molecules to form. But now, in the current era, both atomic and molecular matter are abundant. 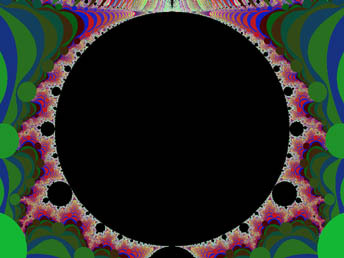 This era corresponds to the region on the Mandelbrot Set from the funnel point at the rear of the cardioid to the opposite end of the large circular region. Note that this bulb or bud, the largest protrusion off the cardioid, is apparently perfectly round or circular. In the universe we now inhabit, matter and energy are quite separate, and most of the substance we have encountered is atomic and/or molecular. We have come to take it for granted, that this is the natural state of things, because the very stuff of which we are made is comprised of atoms and molecules. But it was not possible for matter to congeal from the energy soup, prior to decoupling. Our world is a collection of objects that are comprised entirely of atomic or molecular matter. From the Earth, in the present day, the last moment of the decoupling era appears to have happened billions of years ago (perhaps almost 14 billion). The edge of the decoupling zone is billions of light years away from us, as well, and it appears instead to be everywhere at once. The universe itself has apparently stretched out quite a lot since the time the glow of the fireball was released, and it continues to expand. 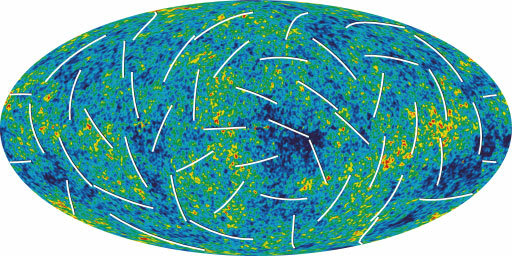 This expansion stretches (or red-shifts) the gamma rays from decoupling (according to conventional cosmology), and turns them into microwaves called the Cosmic Microwave Background radiation (or CMB). This also corresponds to a very low temperature for the universe as a whole, that results from spreading the heat of the cosmic fireball over a broader area, and a much greater volume. A brilliant flash was released, at the time of decoupling. Most of this energy was not visible light, however, but high-energy gamma rays. 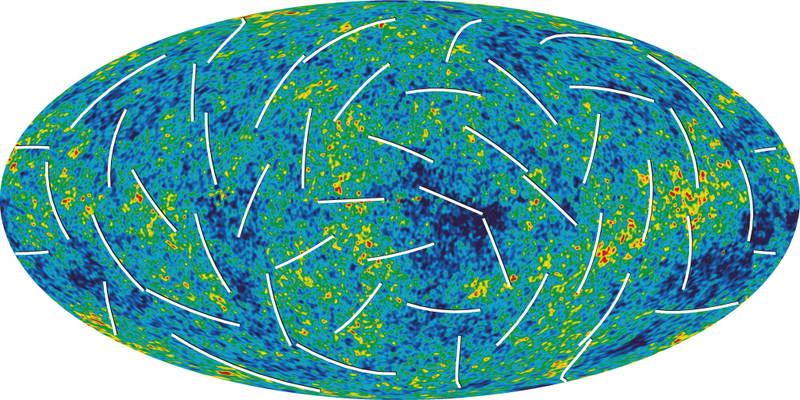 Standard or Big-Bang Cosmology suggests that the Cosmic Microwave Background radiation we detect from everywhere in space is the afterglow of that event (decoupling) stretched out to the current dimensions of the universe. This background radiation floods all of space with white noise in the microwave band. This would sound somewhat like the static on an AM radio, a constant hissing or whooshing sound rather than a tone, if you were to listen to it. It was actually discovered because of this, as it drowned out their signal when early attempts were made to communicate using microwaves. Experiments involving a satellite known as the Cosmic Background Explorer (COBE) showed that it is rather uniform, but there are slight variations in the intensity and spectrum, for different directions in space. The more recent WMAP probe has allowed us to measure these variations with much greater accuracy, revealing their polarization, and this will help us to narrow the field of competing cosmological theories to a handful of working candidates (which are all Inflationalry Universe theories). The most current evidence does not appear to conflict with the theory I am presenting in this paper, but relevant connections are still being explored. The microwave background radiation is fairly innocuous, but it is pervasive, and it is quite important to understanding the origin of the universe. For most folks; what happened that long ago or far away is irrelevant, and if the overall intensity of the CMB is so small, it doesn't matter. Aside from nearby sources of nuclear radiation, the influence of the weak nuclear force is also fairly distant from the concerns of our daily lives. Instead, other forces are at work, and the most active force in the era we inhabit is electromagnetic in nature. We don't always see it at work either, because it acts at the sub-microscopic level holding atoms and molecules together, but it is there, and it is quite active I would argue that electromagnetism is the predominant force of our era. Yes, it is true that the pull of gravity is relatively constant upon us, and that it too is influential, within the scope of our everyday experience, but it is more like part of the background of our lives. Gravity is truly a fact of life, and you get used to it at an early age, so that it too is fairly innocuous. The real action in the world around us takes place when things are set in motion, and this requires energy, as well as substance. There is, of course, the kinetic energy associated with the motion of objects, and this is important. And there is energy bound into forms, as well, but energy can have an independent existence apart from material forms (as the wave-like aspect) and it's most common face is electromagnetic. The prevailing representative of unbound energy (in our local universe today) is the electromagnetic force. It could be argued that all the information we can receive or measure, about the universe, is electromagnetic vibrations. The force known as electromagnetic actually has three components, electric potential, magnetic potential, and vibration. Changes to either an electric or magnetic field will produce changes to the other one, and will likely create waves. More precisely; a moving magnet creates an electric field and a moving electric charge creates a magnetic field. Changing the field strength of one type of field will likewise alter the properties of the other field. In addition, electromagnetic waves will be formed when fields are changing, which will propagate through space. These wave and field phenomena are embodied by particles, electrons and positrons, photons, and possibly magnetic monopoles. Specifically; electrons carry electric charge, and photons carry vibrations or vibrancy (at least in our familiar part of the universe). Note that electromagnetism has both a wave-like nature, or aspect, and a particle-like aspect. Nothing can exist in the physical universe without having a measure of both, so sub-atomic particles like electrons display wave-like characteristics, and light must be manifested as a collection of photons, which individually behave like particles. 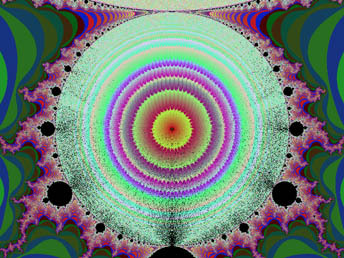 The electromagnetic force is represented in a very interesting manner by the diminishing size areas highlighted in the Fractal Butterfly figure derived from the Mandelbrot Set. In the circular area, below the wings, the disklike objects all seem to be suspended in the trough of waves in the repeller sets, which are those color bands surrounding the set. Each disk is more nearly circular than similar figures in the cardioid region, which are all either truncated or squashed (slightly). They also appear to be floating in the center of ripples in the repeller sets of the same depth (color), or number of iterations. These ripples are almost sinusoidal, and the circular objects are about one quarter wavelength in diameter. 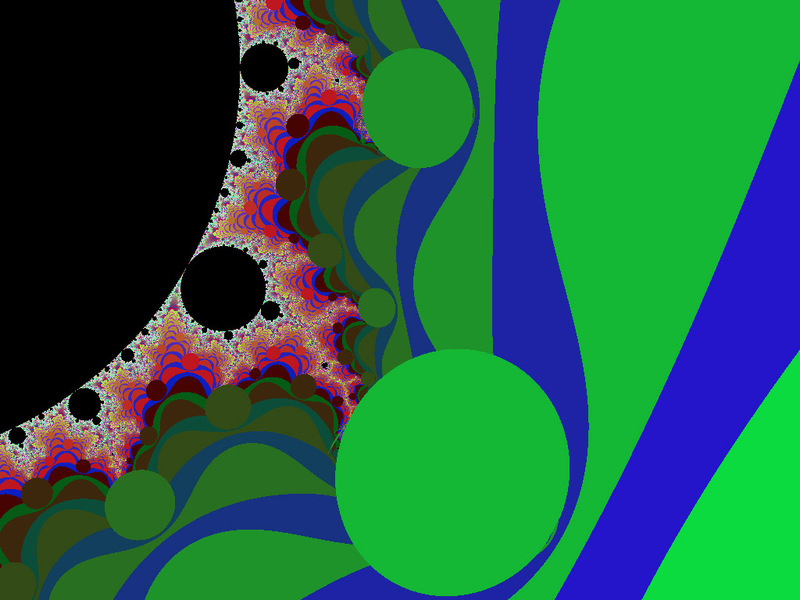 The discs appear to be floating above, or riding within, the waves. One might even say that they appear to be levitating just above the trough of the wave they are riding. This form, or rather the relationship of these forms (circular objects riding in the waves), effectively represents the action of electromagnetic forces on objects. I believe, in fact, that this depicts the ideal, in that the dynamics represented correspond to the largest possible force, or coefficient of action for a given wave. This relationship could, of course, be tested experimentally in a rather fanciful way, by finding out what size beach balls are most readily carried away on a given size wave. I would hasten to add that other factors, such as the weight and the smoothness of the ball, are involved, but there must in fact be an ideal size ball for a given wave. For such a ball, it would tend to roll down the crest of the wave at the exact speed the wave swept up behind it, and therefore the wave would stay with it. Or rather, the ball would stay with the wave. It is my belief that this is a good metaphor for some actions of the electromagnetic force. However; there is a purely attractive and/or repulsive face too, which is constant like gravity, except that it can push as well as pull. This refers specifically to a force which acts at a distance to influence, or impart motion, but the distances can be large or rather small. Electromagnetic forces between individual particles are stronger when they are in close proximity, and decrease with the square of their distance apart But the wave-like nature enter the picture too, at the atomic scale. The standing waves of electromagnetic energy around an atom serve to keep the individual electrons in stable orbits. The miracle is that the standing waves are created by the moving electrons of that atom. These electrons are like particles when they collide with something, but they behave like waves when they are in free motion. Depicted in the repeller sets (the outer color bands) is a clear sense of the wave-like aspect, and the steadily diminishing size areas (the circular shapes) show the particle aspect clearly. The relationship between the two aspects (the wave-like and particle-like natures) is very easily observable here, in part because the waves in the repeller sets are regular. However the electromagnetic force has another duality, as well. The electric and magnetic component don't point the same way. When electromagnetic waves propagate through space, the electric aspect and the magnetic aspect act at a 90 degree angle toward one another, in terms of their phase or directionality. Earlier; I mentioned the idea that the Mandelbrot Set could help us to understand the folding of space (how 2-d becomes 3-d) which creates the geometric climate for the fundamental forces to become distinct entities, and take on their familiar qualities. What we observe in the image above may help to explain how 3-dimensionality came to manifest. Simply put; it may be attributable (at least in part) to the properties of the electromagnetic force, including the need for the electric and magnetic components to be at right angles. And the Mandelbrot Set appears to depict several of those properties, which suggests a connection. We see that each the disks are near the bottom, or trough, of a wave of the same color, and this exemplifies the water-like quality of electricity to find its own level. In this part of the Set, you can see particles of various energies (colors), each in a wave at its own level. On the other side of each disc, energy appears to be pouring in through figures that look like lightning, or perhaps like the tail of a dragon. Note that only even-numbered color bands have circular discs, in this region. Only odd-numbered waves had discs, in the region of the set from +i or -i to (-0.75, 0i), where the Weak Nuclear Force is portrayed, or predominates. The circular disks along the boundary surrounding the circular region of the Set probably represent atoms rather than sub-atomic particles, or atomic nuclei. There is form at all levels of scale, however, so the discs along the edge may be very small indeed. One can look at features in this area over a extremely wide range of scale, or magnification, and the smaller features in any area are found to occur at a higher number of iterations. I believe that, at least to some extent, the scale and iteration count of objects in any area of this figure reflect the level of energy the corresponding objects are at, as well as the actual relative size of objects. This idea is consistent with the situation in the physical universe, where waves of a higher energy are shorter in length, and their photons are smaller in size, where longer wavelengths carry less energy, and have larger photons. Atoms of the individual elements, however, not only have a characteristic size and embody a smaller range of scale (than photons), they actually become larger (rather than smaller) at higher energies. If we look at the detail around the fringes of the Mandelbrot Butterfly at high magnification, we can detect formations which are reminiscent of molecular structures ranging from simple combinations of a few atoms, to long chains of repeated form. Although it seems unlikely that every kind of molecular form is represented, since certain kinds of form (i.e. - closed loops) are not found, almost every possible variation combining groups of circular figures is found in some area of this region. As in most other areas of the set, the circles don't overlap here, but they are arrayed in regular patterns. In some places, they look almost like bundles of grapes. If we imagine that the discs in this region represent atoms, we do see evidence of molecular matter. Though; if the larger discs represent atomic nuclei, we might instead be seeing how nuclei and their electrons are bound. Clusters of atoms, or particles, come together here and there, held in place by what appear to be threads of energy. It is notable that the circular band of form around the point (-1, 0i) would touch a perfect circle about that point with a radius of 0.25 at multiple points. This could depict the apparent flatness of our universe, as this term is used by cosmologists. Will the universe expand forever, or collapse back into a ball? At this point; the possibility that our univere will collapse appears extremely unlikely, as the evidence indicates that the universe's expansion is actually accelerating. For a long time, it appeared that a balance between expanding and collapsing forces exists, but now our best evidence says otherwise. Until recently, we only had an approximate idea of the age of the universe, and we still have only a crude estimate of other things, such as the size of the totality of space (not just the observable part), the mass of all the matter in the universe, and other things necessary to accurately determine the final stage of the universe's evolution. 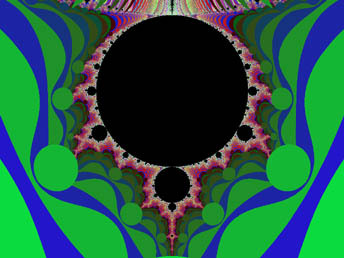 When I first wrote about a cosmology based on the Mandelbrot Set, I thought it depicted a big-crunch ending for the universe, but when I read recent predictions about a cold-dead ending, with black-holes trying to swallow up the last remaining bits of matter, I saw a resemblance to those events, as well, in the Mandelbrot Set and its family of associated figures. I now believe there is a new twist to incorporate, and that the real answer may be yet more interesting. Will the universe go on forever, in its present form. Probably not. It will greatly outlast us, even in pessimistic estimates, but it will almost certainly change. No scenario Science has to offer us claims that the universe will maintain current conditions indefinitely. While there is no clear consensus yet, all of the most likely possibilities involve some kind of ongoing evolution for the universe. Scientists can't tell us what lies beyond the observable edge of space, but most agree that there will always be something beyond what we can ever observe. This raises serious questions about whether the measured expansion of the universe is truly universal, or just relatively constant in the region of the local group of galaxies. Perhaps all of the observable part is only a small part of the universe, but nobody knows exactly how much. However, the Hubble telescope observations and the new WMAP data do give us insights we did not have before, which may help us to answer the question definitively. The Cosmology theory I derived from the Mandelbrot Set (at first) seemed to suggest that the universe is headed toward an ending in gravitational collapse, which seems unlikely from our current perspective. However; if what it describes is the folding of space, and if the expansion is speeding up as the universe is turning inside out (in effect), then it will not just go on expanding forever, but will instead begin a new cycle of creation, and I'll go into more detail about this in the next chapter. This leaves open the question of whether this theory supports the concepts of Plasma Cosmology, which also results in a fractal distribution of matter in space. A lot depends on how we interpret the form we see, and much of that interpretation is mostly subjective. If the evolution of form along either edge of the Set is a model for the progression of events in time, how do we deal with the fact that there are two separate streams, one along the right and another along the left edge? Among other things; the Fractal Butterfly figure might suggest that a whole universe (or another branch) exists on the other side of space, a universe of antimatter, moving backwards in time (relative to us). It also could suggest that the fabric of space-time is being bent back upon itself, to allow these two halves of the universe to meet. We have not seen clear evidence of this (such as gamma-ray streams), but some theorists believe the available evidence supports this notion. If there were to be a coming together, this may not happen for billions of years, but the theory cannot shed light on this, until we characterize the actual (or current) stage of evolution (and its corresponding location on the Mandelbrot Set) for this region of physical space. Although I can state that we live in a particular region of the chart (where the electromagnetic force reigns) approximately, and I can do so with some certainty, I can't say with precision which blip along the edge corresponds to the character of our local universe most closely. Perhaps it would be more apt to characterize our universe as existing along a range of possible locations on the chart, as a whole range of possible interactions are possible in our local universe. The fact that the electromagnetic force predominates in this part of the universe, does not mean that it is the only game in town. Gravity continues to pull upon us, radioactive elements continue to decay and thus express the weak force, and the Sun continues to use the strong nuclear force to fuse light nuclei, like hydrogen, into heavier elements. Thus; all of the forces come into play, and not just one. However there is a way in which the EM force rules all we can measure or experience in the local universe. Waves of vibrational energy, and electric or magnetic currents, can shape all of the other forces in terms of precisely how they manifest. Electromagnetic forces can move and direct the flow of matter in the universe, most especially charged particles. More importantly still, at least to us, they can set the stage for, and alter the parameters of chemistry, defining how the elements can combine. That is; what we know as chemistry is built on the foundation of electromagnetic interactions, taking place at the atomic level, and between atoms. The electromagnetic force plays a part in all chemical reactions, and it allows the formation of molecules and aggregate structures made of molecular physical matter. If the EM force did not manifest as it does, there would be no chemistry, as we know it. So we could call this the era of chemistry. We are definitely in a cosmological era where chemistry can manifest, and it influences our lives greatly. How chemistry relates to electromagnetism is not immediately obvious, but all chemical bonds are formed by magnetic, electric, and vibrational forces. This would suggest a marraige of the two. It seems likely to me that we have only scratched the surface, as regards the subject of vibrationally activated chemistry, but this approach has shown great promise in recent experiments, and has already seen several practical applications. If the area of the Set around the large circular region depicts electromagnetic forces, this should give us new insights into this topic. 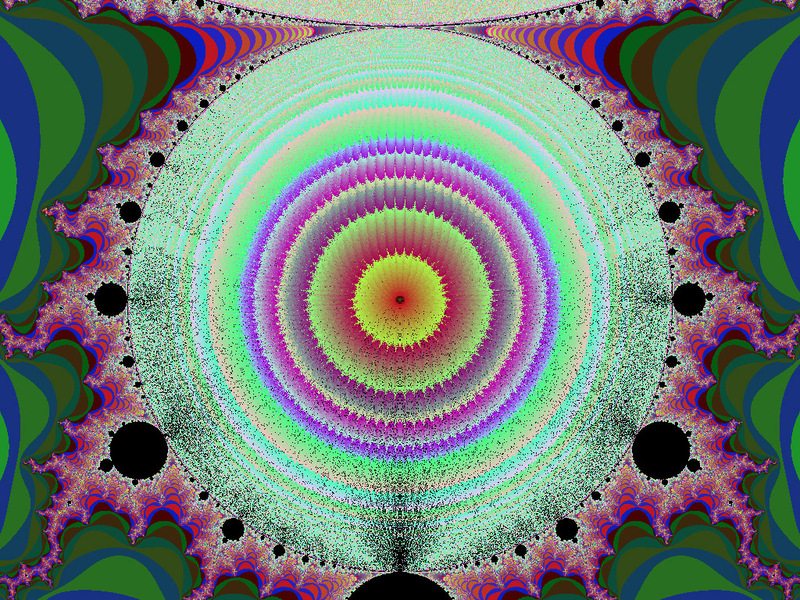 What the Mandelbrot set has to say about this force should allow further refinements and spur developments in chemistry too. The study of this region of the set has already shown great promise, in allowing a more subtle understanding of things I have not yet discussed. This region is best seen as representative of the contrast with the character of form on either side of it, as the meaning of this theory is to show that there is a progression of form, or a succession of differing qualities that manifest in turn. 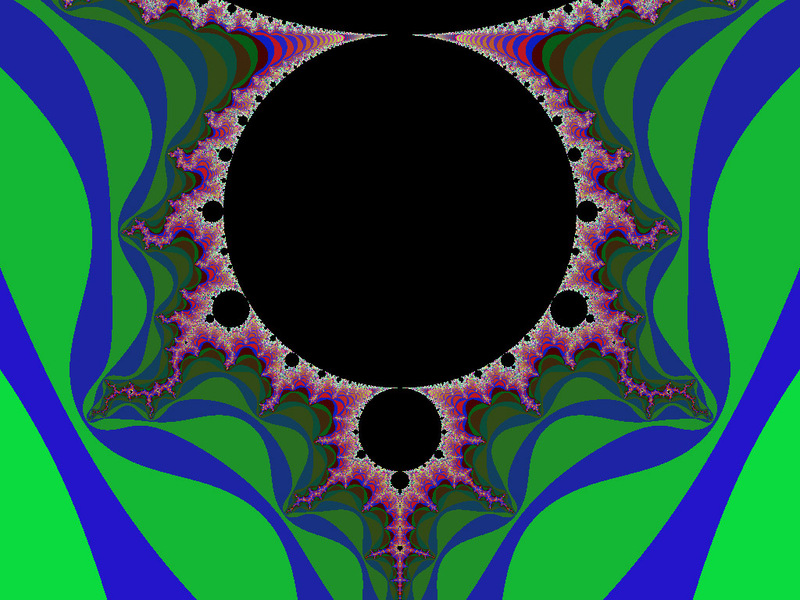 All form in the Mandelbrot set appears to be in a stage of transition between what comes before it, and what comes after it. That is, each segment is a blend of the natures of what borders it on either side. Perhaps the fundamental forces of the universe are much the same. Although we seem to be able to clearly delineate these forces, that does not mean they ever stand alone. They are defined by their relationship to each other, as well as by their basic character. The next force I will examine is gravity, and the next era to examine is what could be called the universe's endgame. Our Fractal Butterfly has both a head and a tail, and they are connected. And as I just said; each stage is a transitional phase of things. Perhaps this means the Mandelbrot Set can help us to unravel the connection between the electromagnetic force and gravity. The next chapter explores the form near the Set's tail, and the implications (or predictions) regarding the gravitational force and the possible end of the universe.